Will traffic lights at KPT Junction ease traffic woes? 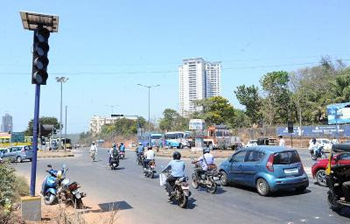 Mangaluru, Feb 16, 2017: It is seen that Mangaluru City Traffic Police in an attempt to streamline traffic at KPT Junction have installed traffic lights. Nanthoor Circle, KPT Junction and Mahaveer Circle, which provide crucial access to the city from the Kochi-Mumbai National Highway 66, are becoming a motorist’s worst nightmare. Though the Mangaluru city traffic police have tried to streamline traffic at these three points frequently, they have not been successful. Its back to square one within a few weeks after such drives or when the extra personnel to man the traffic have been removed. The interventions by police have seen marginal improvements during peak hours with constant monitoring by police and traffic wardens. Now police are attempting to minimise police personnel at KPT Junction by installing traffic signals. The signal lights started functioning on Feb 12, Monday evening on a trial basis. NH officials inspected the site and agreed to carry out certain improvements at the junction for smooth flow of traffic. Assistant commissioner of police (traffic) K Thilakchandra said the trials are going on for setting the frequency since there is convergence of traffic from four points. "Though we initially kept 50 seconds for NH traffic and 30 for city traffic (Airport Road to city and vice versa), we noticed problems with loaded vehicles having problems on NH due to the steep gradient. We are observing the frequency and soon we will arrive at the best possible frequency for allowing traffic," he said. He also said that the Honnakatte-Kulai signal lights installed simultaneously along with KPT Junction are working fine from Tuesday with frequency setting done. The signal lights have both auto and manual mode and can be changed depending on traffic density. The ACP also said that NHAI officials have been briefed about the need to make certain changes to traffic island at KPT Junction since the island is in such a position that two big vehicles cannot move simultaneously creating unnecessary and avoidable gridlocks. "They (NHAI officials) have understood the problem and have agreed for rectification,’’ he added. Will this help city commuters? Most of the traffic woes in the city prevails due to irregular parking .